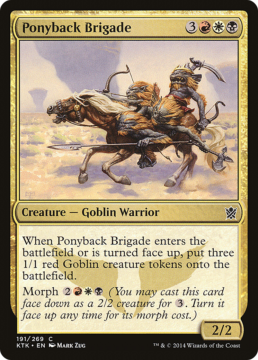 Welcome back to the Khans of Tarkir: Cubed series! This time, I’m discussing the most important part of having a cube: actually playing it! I rounded up 7 friends to take part in the most important step of building a cube: playing it! I collated boosters the night before, so when we showed up, there was no time wasted getting into the draft. This first draft was really important to gather feedback on the number of copies of each card at each rarity I chose to use. The goal of the cube is to have it feel as close to cracking open a fresh box of Khans of Tarkir from a shop, without requiring a tedious number of copies of each card in the set. Was the way I built my cube going to make it feel too different to the real thing? Before we began, I explained the limitations of the cube: 4 of each common, 2 of each uncommon, 1 of each rare or mythic. This way all participants had access to the same information before we began. Richard ended up going 2-1 with this 5 colour list! I also went 2-1 with this classic Sultai deck. We both ended up losing to the 3-0 deck, which also demonstrates an aspect of Khans that I loved – sometimes, if everyone else was drafting slow decks with greedy manabases, you could just run them over with a sufficiently aggressive start, and a dash of synergy. But this BW Warriors deck had more than a little synergy! 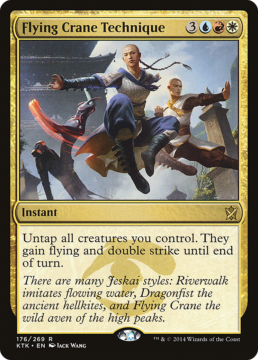 This tension in the format of drafting the clans, then greedily playing more colours for the powerful cards (especially the common morphs), and two colour decks coming in underneath to punish the slow strategies, contributed to the depth of experience the set offered for fans of limited Magic. So the cube was successful in its main goal: feel like a triple Khans of Tarkir draft! Decks of all kinds turned up to play, and a great time was had by the players. But what other learnings were there to be had from the first play test? While some commons did turn up in multiples in a small number of boosters, the players reported that it didn’t feel strange to draft, or even throw them out of the “Khans experience”. On reflection, this already can happen in sealed product, thanks to foils. So no problem there! Uncommons appearing between zero and two copies meant the draft felt quite normal. The players were aware of the limitation though. One noted that he considered the fact that he was guaranteed not to get a chance at a third of a particular card when he was passed the second and only other copy, but didn’t end up changing his card of choice due to it. My suspicion is that three copies of each uncommon is the sweet spot for allowing fun variance in the numbers of sweet uncommons that actually appear in a single draft, without making my cube too massive. However for now, I will leave the uncommons alone and get more data next time. Multiple players reported that knowing the rares were singleton affected decisions made during gameplay significantly. During games, in particular a format with extra “tricks” in the form of morph creatures, knowing what you’d already seen in your own or your previous opponents decks can dramatically narrow down what should be played around. Hidden information loses its power when players can eliminate options – if you just played against a Master of Pearls, you know with complete certainty that you don’t need to play around it going forward. Additionally, tri-coloured haymakers like Flying Crane Technique or Crackling Doom can sometimes get passed around until they reach a player in that exact clan, so getting two not just in one draft, but in one deck isn’t unheard of. But right now, you can breathe a sigh of relief when the first one hits the graveyard! As a result, I believe it is vital to introduce at minimum a second set of all the rares to the cube. This was already in my plan for the cube, but I wasn’t sure how high priority it should be – now I know, it has to be done before the cube is drafted again. I hope this has helped inform you if you’re building your own set simulation cube! In my next article, I’ll discuss the philosophy of booster collation, and will have drafted the cube again after adding another set of rares for more data. Next Next post: P1P1 Core Set 2019 is up! Get picking!